Patisserie Coralie located at 600 Davis Street. The second Evanston Coralie location, Cafe Coralie, opened Feb. 9. 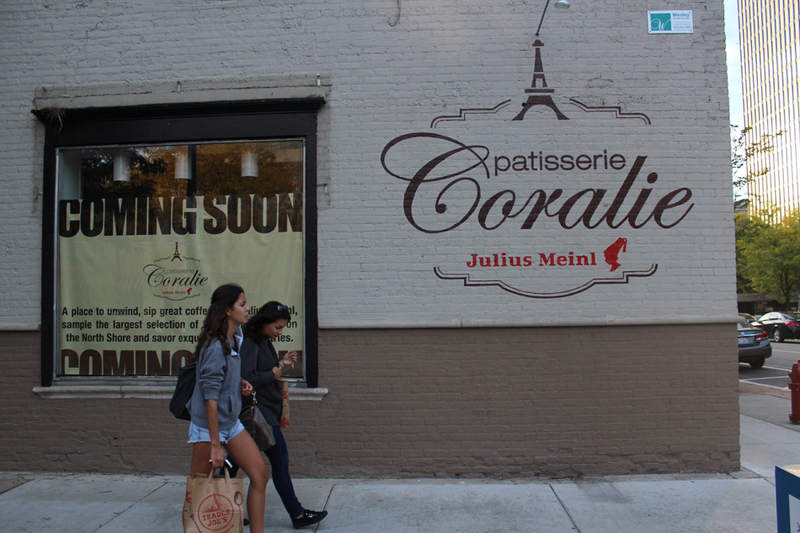 The second Evanston Patisserie Coralie location, Cafe Coralie, opened Feb. 9 on Howard Street, taking the place of a former Evanston Police outpost. The cafe — located at 633 Howard St. — is an extension of the first, director of operations Fiona Lazar said. The larger space allowed them to add more couches and create a “more luxurious feel.” She said other than size, the cafe has the same interior aesthetic and menu as the patisserie. Both locations offer traditional French pastries, the “largest selection” of macarons in the Chicago area as well as quiches and sandwiches, according to their website. The cafe also has a larger kitchen than the other location, allowing owner Pascal Berthoumieux to form a new business model, said economic development manager Paul Zalmezak. Lazar said the added kitchen space makes it easier for the business to sell large quantities of macarons to hotels downtown, country clubs and other cafes in the area. “Our kitchen in Patisserie Coralie just didn’t provide space to do anything like that so this is an opportunity to expand,” Lazar said. Berthoumieux formerly owned a business now called Z Breakfast Club, located at 1512 Sherman Ave., and owned Bistro Bordeaux, a restaurant that closed last spring after seven years in business. At the time of the closing, Berthoumieux said he hoped to open a new Coralie location. Zalmezak said Berthoumieux has been trying to expand his production to reach more customers than just those he serves at the patisserie. Zalmezak added that the cafe helps aldermen deliver on their promise to find a daytime restaurant near Howard Street that would serve the community from morning until mid-afternoon. The cafe will also add more traffic to the street during the day, complementing the business generated by the restaurant Peckish Pig, he said. The city has been working to bring more businesses to Howard Street for several years. EPD left its outpost at 633 Howard St. in 2015, after moving there from 745 Howard St. in 2001. In November, EPD vacated its outpost on Howard Street, marking a newfound confidence in an area that has had active police presence for nearly 30 years. Ald. Ann Rainey (8th) told The Daily at the time that the south end of the city has come a long way since EPD first opened an outpost in the area in 1987. She said before the outpost opened, there was not much foot traffic, though there were some businesses. Rainey, whose ward houses the new cafe, said the space has never been on the tax rolls before. She also noted the neighborhood may “smell really good” from the baking. Clare Proctor and Caity Henderson contributed reporting.